Join Salon97 on July 1, 2014 for our first-ever “Saloon97” event at 50 Mason Social House! 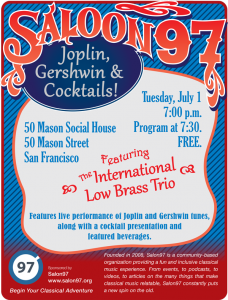 The International Low Brass Trio will perform tunes by Scott Joplin and George Gershwin, and we’ll also have a special cocktail presentation. It’s free! What’s not to love about that? Register via Eventbrite! This venue is strictly 21+. Entry will be guaranteed for Eventbrite registrants until 7:30 p.m. Admittance is first-come, first-served after 7:30 p.m.